Down one set to none to host Minnesota, the Oregon Ducks fought off nine set points in the second set on their way to a four-set win over the second-seeded Golden Gophers in the Sweet Sixteen round of the NCAA Division I volleyball tournament on Friday. Seven higher-seeded teams also advanced to the Elite Eight, four in sweeps. Oregon had defeated Minnesota in four sets — all of which were decided by two points — in early September, but gave up a 7-1 run midway through the first set on Friday to fall behind 14-8 in front of a partisan Gopher crowd in excess of 5,000 fans. The Ducks didn’t get closer than two the rest of the way and lost, 25-21, on the last of Alexis Hart’s six kills. The second set will go down as one of the most epic (and highest-scoring) in NCAA tournament history. Minnesota broke on top 4-0 and threatened to establish momentum for what they hoped would be a sweet revenge sweep. The Ducks rallied, however, and caught the Golden Gophers at 7-7. 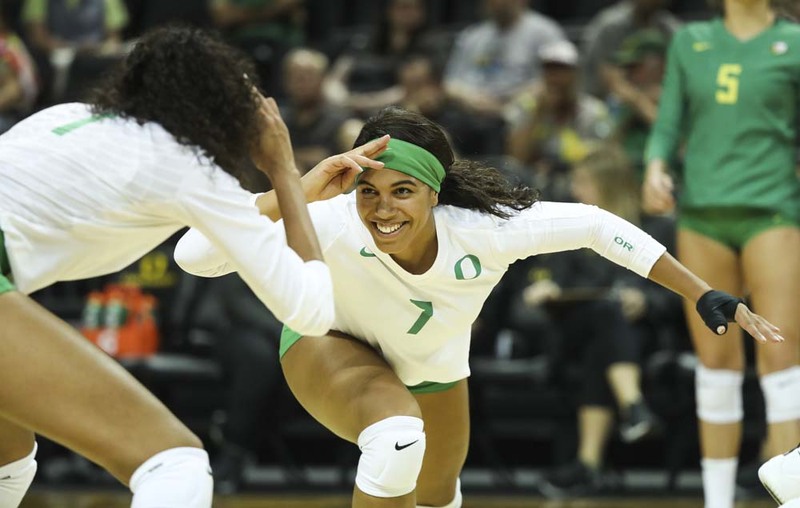 Oregon used a kill and two aces from Ronika Stone to go on top, 19-15, as the game entered its late stages, but Minnesota rallied with four straight, two on Hart kills, to forge ahead, 22-21. A kill by Taylor Morgan gave Minnesota set point at 24-23, the first of nine, none of which it could convert into a 2-0 set lead. The Gophers thought they’d won it leading 38-37 when Hart converted a swing after a Samantha Seliger-Swenson pancake dig, but the call was overturned after a replay challenge, with Oregon’s Lauren Page credited with the kill. Oregon had seven set points of its own in the set, which produced 80 total points. The Ducks had no luck the first six times, but found success on the seventh. Tied at 39-39 with Willow Johnson serving her left-handed, straight-down jump floats, Oregon took the lead for good as libero Brooke Nuneviller set up Brook Van Sickle for the putaway. On the next point, Oregon employed the exact same formula to win, 41-39. The adrenaline from the win helped Oregon open Game 3 on a 5-0 run, which included blocks by the Oregon front line of Page and Johnson for the first three points. The Ducks won that set comfortably and fought back from a 4-0 deficit to start the fourth to win, 26-24, clinching advancement on Stone’s 20th kill of the match. “We decided that, no matter what, we were going to be fearless in everything we did,” added senior setter August Raskie on the same site. Raskie was one of many stars on the night for Oregon. She recorded a triple-double, with 60 assists, 11 digs and 10 kills, and Oregon hit .313 for the match. Three other Ducks reached 10 or more kills: besides Stone, Lindsey Vander Weide contributed 17 along with 18 digs and Johnson had 15 kills and 10 digs. Page’s big day included nine kills and six blocks. Nuneviller had a match-high 25 digs and three aces. Seliger-Swenson, the Big Ten Player of the Year playing her final match in a Minnesota uniform, had 55 assists and 10 digs in the loss. Oregon will take on Nebraska in the Elite Eight tonight at 6 p.m. EST. The defending national champions snapped Kentucky’s 23-match winning streak with a decisive sweep. Outside hitters Mikaela Foecke and Lexi Sun combined for 27 kills and freshman setter Nicklin Hames had a double-double for the Huskers, her school-record tying 22nd of the year. SEC Player of the Year Lead Edmond was held to just seven kills and .040 hitting in the loss. Elsewhere, No. 1 Stanford defeated Washington State for the third time this year, winning in four behind huge nights from middle blockers Tami Alade and Holly Campbell, who combined for 22 kills while hitting over .500 and added 14 blocks. Taylor Mims had 17 kills and 10 digs for the 16th-seeded Cougars, who rallied from a 23-19 Game 2 deficit to square the match at a set apiece but could not sustain the momentum. Stanford will face Penn State at 10 p.m. EST. The eighth-seeded Nittany Lions fought off a set point in the first to sweep Washington. OH Taylor Leath led the way with 12 kills on 23 swings against just one error. She was one of three with 10 or more kills for Penn State. No. 3 Illinois had no trouble sweeping past No. 14 Marquette to reach the national quarterfinals. The Illini hit a blazing .552 in the first set to set the tone for the match. Jordyn Poulter had 38 assists and three kills and middles Ashlyn Fleming and Ali Bastianelli combined for 17 kills on just 25 swings in the win. Sixth-ranked Wisconsin is up next for Illinois, today at 4 p.m. EST, after the Badgers crushed San Diego, 13, 16 and 10. Wisconsin hit .515 for the match compared to .045 for the Toreros and its five hitters, Dane Rettke, Tionna Williams, Grace Loberg, Madison Duello and Molly Haggerty, combined for 36 kills on just 62 swings with a total of four errors. No. 4 BYU rallied from a set down to chomp the Florida Gators in four sets. Roni Jones-Perry had 17 kills and middles Kennedy Eschenberg and Heather Gneiting combined for 19 kills and 14 blocks for the victorious Cougars. BYU takes on Texas today at 8 p.m. EST. The Longhorns overcame a game Michigan team by splitting 29-27 decisions in Games 3 and 4 and winning the other two sets decisively to prevail in four sets. After Texas won the first, the Longhorns appeared set to take the second when a back row block call on setter Jhenna Gabriel, which could (and probably should) have gone the other way as an over-the-net call on Michigan, changed the momentum. The Wolverines had three set points in the third set, but Texas won each on kills from Yaazie Bedart-Ghani, Micaya White and Morgan Johnson before a kill from Brionne Butler put the set in Texas’ column. White, Logan Eggleston and Bedart-Ghani combined for a great hitting day from the pins for Texas. The trio had 53 kills on 111 swings. Carly Skjodt closed out her brilliant career with 16 kills and nine digs in the loss for Michigan.